Robert Martensen, A Life Worth Living: A Doctor's Reflections on Illness in a High-Tech Era (New York: Farrar, Straus & Giroux, 2008). In recent years, doubtless because of the anxious disquiet of so many who have witnessed experiences of their friends and families, books examining “end-of-life issues” have become so numerous as almost to constitute a little genre of their own. At first glance, Dr. Martensen’s book appears to fall neatly within this category. The emergency physician and medical historian recounts numerous memorable patient stories, discusses technology overuse at end of life and the ambiguities of "medical futility" when most doctors have seen the occasional almost-miraculous recovery, and says he wants the book to assist those with “difficult choices.” Martensen is perceptive and balanced about the terrors and disruptions of serious chronic illness, and its shifting, confusing territory, and I think the book is of real potential use – as he wishes – to those facing advanced illness. But though parts of A Life Worth Living are a worthwhile contribution to this sub-genre, the book as a whole – as its title indicates – is more: a broad reflection on what does make life worth living, and how dealing with the inevitable distresses of life can go much better or worse depending both on personal meanings, efforts, and decisions and also on societal conditions (including realities of the medical system). Martensen does not confine his reflections to one end of life. His chapter on sick children is imbued with great respect for them and their situation. With both children and very old people, the triangulated nature of interactions with the families can present many problems. Martensen wonders whether we are wronging minors by allowing parents to make exclusive decisions on treating them, telling a haunting story of a girl who underwent many brutal procedures before her death from cancer, including amputations of her legs, hips and lower pelvis. When I decided to become a doctor in the 1970s, I never expected to practice in an America where the dire has become an everyday experience for so many…For the past thirty years, however, life has not gotten better for our most vulnerable. Through Democratic and Republican administrations alike, compassion has been scarce, despite political and commercial expressions to the contrary. Though our health care approaches squander billions on extravagant treatment regimes that end up accomplishing little, as a society we refuse to adopt the small, even tiny, adjustments that could easily reduce the clawing uncertainties that now degrade millions. Martensen talks about the jolting contrast of seeing a diabetic die in his emergency department as a result of having to scrimp on his expensive insulin, right before attending a luncheon where a university chancellor triumphantly announced the legislatively-permitted transformation of his hospital to an “entrepreneurial private-public partnership” that would expand to add new, lucrative, heart and stroke centers, while the hospital would be permitted to cease functioning as a public hospital and state funding for indigent care at the hospital would be phased out. Martensen is troubled, too, when he is urged (perhaps too early, in his mind) to press grieving parents for organ transplants that will be financially beneficial for the hospital. Though he's acutely aware of the bigger picture, Martensen doesn't let that interfere with attending to the details of what we all need to try and do within a system we cannot control to have the best outcomes possible for ourselves, for family, and for patients. He is hopeful and humane about the quest for meaning and dignity in difficult circumstances. Martensen covers such wide territory that the book (like this review) can be a bit disjointed, even though everything truly relates to his title and central theme. But that's a minor flaw. This short, engaging, readable book packs an enormous punch, and I heartily recommend it. There have been multiple legislative attempts at major health care reform in the US. Typically, such attempts feature considerable public debate, including speechs, congressional committee hearings, sometimes progressing to debates by the House and Senate. (For example, see this Frontline chronology of the proceedings up to the passage of the Affordable Care Act, aka "Obamacare," in 2009.) Usually the discussion includes some real experts on health care policy, and some real health care professionals, and at least appears to reference some data about medicine, health care, and health economics. Whether previous debates were truly evidence-based is not clear, but it appeared to me that they at least acknowledged the importance of evidence, and maybe even at times a rigorous approach to it. President Trump and House Republicans, in their rush to resuscitate a bill rolling back the Affordable Care Act, are increasingly isolating themselves from outside input and rejecting entreaties to work collaboratively, according to multiple healthcare officials who have tried to engage GOP leaders. And senior House Republicans and White House officials have almost completely shut out doctors, hospitals, patient advocates and others who work in the healthcare system, industry officials say, despite pleas from many healthcare leaders to seek an alternative path that doesn’t threaten protections for tens of millions of Americans. 'To think you are going to revamp the entire American healthcare system without involving any of the people who actually deliver healthcare is insanity,' said Sister Carol Keehan, president of the Catholic Health Assn., whose members include many of the nation’s largest medical systems. Rep Roger Marshall (R-Kansas): the Poor "Just Don't Want Health Care"
'The Medicaid population, which is [on] a free credit card as a group, do probably the least preventive medicine and taking care of themselves and eating healthy and exercising. And I’m not judging; I’m just saying socially that’s where they are,' he told STAT, a website focused on health-care coverage. The problem is that Marshal, who is a physician, did not provide evidence that there is some essential characteristic of the poor that causes them to make bad health decisions, or discus whether perhaps the poor face constraints on their health care decision making that the rich do not. The implication appears to be that Marshal is treating an promoting an ideological or religious opinion as if it were derived from epidemiology. House Speaker Paul Ryan (R-Wisconsin) The Problem with "Obamacare" is "the People Who Are Healthy Pay for the People Who Are Sick." that Ryan doesn’t seem to understand what “insurance” means. Look at that quote again: The whole idea of Obamacare is … the people who are healthy pay for the people who are sick.' Well, yes. The whole idea of health insurance is to establish a system in which the people who are healthy pay for the people who are sick. This really isn’t that complicated. In fact, it’s incredibly common for the vast majority of Americans: we pay premiums, the money goes into a pool, funds from that pool pay for care. It’s Insurance 101. If Ryan disapproves of this model – which is weird, given that his own reform bill is built on consumers getting coverage through traditional insurance – there are effectively three alternatives. If the healthy aren't going to pay the sick, who will? The sick can try to pay for themselves, the government can pick up the tab, or the sick simply won't get care. Rep John Shimkus (R-Illinois) Why Should Men Have to Purchase Prenatal Care? 'What mandate in the Obamacare bill does he take issue with?' Doyle asked Shimkus, using the formal parlance of congressional committees. 'What about men having to purchase prenatal care?' Shimkus said. At that point, one could hear the room start to stir. Health insurance, like all insurance, works by pooling risks. The healthy subsidize the sick, who could be somebody else this year and you next year. Those risks include any kind of health care a person might need from birth to death — prenatal care through hospice. No individual is likely to need all of it, but we will all need some of it eventually. So, as a middle-aged childless man you resent having to pay for maternity care or kids’ dental care. Shouldn’t turnabout be fair play? Shouldn’t pregnant women and kids be able to say, 'Fine, but in that case why should we have to pay for your Viagra, or prostate cancer tests, or the heart attack and high blood pressure you are many times more likely to suffer from than we are?' Once you start down that road, it’s hard to know where to stop. If you slice and dice risks, eventually you don’t have a risk pool at all, and the whole idea of insurance falls apart…. allow insurance companies to require people who have higher health care costs to contribute more to the insurance pool that helps offset all these costs, thereby reducing the cost to those people who lead good lives. They’re healthy; they’ve done the things to keep their bodies healthy. And right now, those are the people who have done things the right way that are seeing their costs skyrocketing. He seems to be arguing first that people who virtuous ("good") are healthier than others. He certainly provided no evidence for this assertion, which, like the assertion by Rep Marshall above, appears to be ideological or religious judgment disguised as epidemiology. Rep Paul Labrador (R - Idaho) "Nobody Dies Because They Don't Have Access to Healthcare"
Labrador made the comments the day after the U.S. House passed a GOP-led health care bill repealing and replacing chunks of Obamacare. Labrador, a member of the conservative House Freedom Caucus, was responding to an audience member who expressed concern about how the bill would affect Medicaid recipients. 'You are mandating people on Medicaid accept dying. You are making a mandate that will kill people,' the audience member said, before being drowned out by Labrador's response. It is not completely clear whether Rep Labrador meant access to health care, or access to health care insurance. A person with appendicitis, acute bacterial pneumonia, a myocardial infarction, etc, etc who fails to seek acute care because of lack of a means to pay for it could well die. As an absolute, this statement is obviously untrue. This is not exactly the clearest statement but it seems to imply that only people who make unhealthy life-style choices get diabetes, which certainly as an absolute is not true; and furthermore that people who develop diseases due to poor life-style choices do not deserve care. The juxtaposition suggests that driving this is an ideological or religious judgment about who is deserving. Video diversion: would Mr Mulvaney think this person deserves "health care?" Postmodernism is 'an attempt to question the fundamental philosophical and political premises of the West. It argues that many of the concepts we take for granted—including truth, morality, and objectivity—are culturally ‘constructed’' To postmodernists, truth is just what the powerful say is true. Facts, however, are stubborn things. Evidence is evidence, no matter what politician it might offend. Basing legislation on the sorts of alternative thinking displayed in the cases above could lead to real life, or life and death consequences for the sick, injured and vulnerable. True health care reform requires clear thinking and the input of people who actually know something about health care. Will the Current Crises Finally Prompt America to Address How it is Haunted by Corruption and Impunity? There is one tiny silver lining in the political storm clouds swirling over the US. Some of the issues about which we have been ranting on Health Care Renewal are no longer so easily dismissed. We have long harangued about the ruinous effects of health care corruption, the role of impunity in enabling worsening corruption, our lack of good ways to challenge these problems, and our ongoing inablity to even discuss what amounts to taboo topics (which we dubbed the "anechoic effect.") In response, we have been called alarmists, nay-sayers, and worse. Now the parade of crises created by the Trump regime have made these problems salient to American society. In 2006, TI published a report on health care corruption, which asserted that corruption is widespread throughout the world, serious, and causes severe harm to patients and society. the scale of corruption is vast in both rich and poor countries. Corruption might mean the difference between life and death for those in need of urgent care. It is invariably the poor in society who are affected most by corruption because they often cannot afford bribes or private health care. But corruption in the richest parts of the world also has its costs. The report did not get much attention. Since then, health care corruption has been nearly a taboo topic in the US. When health care corruption is discussed in English speaking developed countries, it is almost always in terms of a problem that affects benighted less developed countries. On Health Care Renewal, we have repeatedly asserted that health care corruption is a big problem in all countries, including the US. But even after Pope Francis decried health care corruption, the topic remained anechoic. Yet somehow, a substantial minority of US citizens, 43%, seemed to believe that corruption is an important problem in US health care, according to a TI survey published in 2013 (look here). But that survey was largely ignored in the media and health care and medical scholarly literature in the developed world, and when it was discussed, it was again in terms of results in less developed countries. Health Care Renewal was practically the only source of coverage in the US of the survey's results. Designing investigations into high-level misconduct is extremely difficult. Every nation has tough choices to make, and none has come up with a perfect solution — though it’s clear that the US system is uniquely bad. The author noted that the US Constitution provides no clear mechanisms for addressing corruption, and in their absence, at best "we'ver jerry-rigged things instead." So it is good that there is now some minimal public recognition that we in the US have not developed an effective approach to corruption. The unasked question, of course, is why not. Just becauses our constitution is more than 200 years old is not really an excuse. Constitutions can be amended and laws can be written. I submit that we have been in a long-standing state of denial about the existence of corruption, based perhaps on an erroneous conception of American exceptionalism, and enabled by those who have gotten rich off corruption, and for a long time have been using substantial resources to keep the problem anechoic. Now we pay the penalty for our perhaps wilfull ignorance. We have long railed against the impunity of top leaders in health care. We have gone on ad infinitum about the parade of legal settlements made by large health care organizations after allegations of often egregious misbehavior, including episodes of bribery, fraud, kickbacks, and other crimes. Typically, such settlements allowed the organizations to walk away after paying a monetary penalty that may have appeared big, but was tiny compared to the monay that could have been made from the misbehavior. In particular, almost never does anyone at the organizations who authorized or directed the bad behavior, particularly top executives, suffer any negative consequences at all, even when they may have made huge bonuses because of the revenues such behavior generated. The continuing impunity of top health care leaders only seems to encourage future bad behavior. So imagine my surprise when Vox published on May 18, 2017, an article entitled, "Trump isn’t a toddler — he’s a product of America’s culture of impunity for the rich." Its author, Matthew Yglesias, indicted President Trump as a long time beneficiary of impunity, whose behavior was enabled by impunity, and who is thus typical of American corporate leaders. He’s a man who’s learned over the course of a long and rich life that he is free to operate without consequence. He’s the beneficiary of vast and enormous privilege, not just the ability to enjoy lavish consumption goods but the privilege of impunity that America grants to the wealthy. Trump’s 'law and order' attorney general wants to throw the book at relatively small-time drug offenders. Trump himself has spent his entire career skating away from lawbreaking with a fine paid here and a political contribution there. He’s an unusual figure, but also very much an exemplar of his era and a product of a decades-long ideological campaign to do as much as possible to empower the wealthy and powerful. core belief that as long as you're an A-lister, there are no rules worth obeying. And when you're a star, they let you do it. You can do anything. What’s beyond question, however, is that Trump’s expressed view that a rich and famous man like him can get away with anything is both sincere and largely correct. From his empty-box tax scam to money laundering at his casinos to racial discrimination in his apartments to Federal Trade Commission violations for his stock purchases to Securities and Exchange Commission violations for his financial reporting, Trump has spent his entire career breaking various laws, getting caught, and then essentially plowing ahead unharmed. When he was caught engaging in illegal racial discrimination to please a mob boss, he paid a fine. There was no sense that this was a repeated pattern of violating racial discrimination law, and certainly no desire to take a closer look at his various personal and professional connections to the Mafia. His entire adult life, Trump has been able dodge legal trouble simply by using his bank account as a shield. When Trump Management was sued by the government in 1973 for refusing to rent apartments to people of color, Trump and his father were able to settle without any admission of guilt. When students at Trump University sued him for defrauding them, Trump simply wrote a check for $25 million to make it all go away. Marriage in the tank? He's got a pre-nup. Casino business going belly-up? He goes to bankruptcy court, walks away, and writes another book praising his own genius. entirely emblematic of America’s post-Reagan treatment of business regulation. What a wealthy and powerful person faced with a legal impediment to moneymaking is supposed to do is work with a lawyer to devise clever means of subverting the purpose of the law. If you end up getting caught, the attempted subversion will be construed as a mitigating (it’s a gray area!) rather than aggravating factor. Your punishment will probably be light and will certainly not involve anything more than money. You already have plenty of money, and your plan is to get even more. So why not? beyond Trump, America is desperately in need of a larger political reckoning as well. The entire culture of civil fines and settlements without admission of wrongdoing that dominates American business regulation is fundamentally odd. If the rules say you can’t keep your casino afloat with an unapproved loan and you respond to that by getting a shady secret unapproved loan to keep your casino afloat, shouldn’t you be out of the casino game? If compliance with money laundering rules is mandatory and you don’t comply, shouldn’t you be shut down? Any given case obviously presents its nuances, and not every case can be taken to the mattresses. But the settlement racket too easily lets regulators feel like they’re putting points on the board even while criminals continue to roam the streets, having learned the lesson that they’re untouchable. That, fundamentally, is Trump’s problem. Not that he can’t control himself, but that he’s been taught he doesn’t have to. Sometimes crises do illuminate long festering problems. If the US survives the current serial crises, maybe we will be able to develop a more open, rational and effective approach to corruption and impunity, including their health care variants. So to repeat an ending to one of my previous posts on health care corruption.... if we really want to reform health care, in the little time we may have before our health care bubble bursts, we will need to take strong action against health care corruption. Such action will really disturb the insiders within large health care organizations who have gotten rich from their organizations' misbehavior, and thus taking such action will require some courage. Yet such action cannot begin until we acknowledge and freely discuss the problem. The first step against health care corruption is to be able to say or write the words, health care corruption. Channeling Lyndon Johnson on Walter Cronkite, in clinical medicine, when you've lost Boston (including MGH), you've probably lost the health IT war. It happens every day, in exam rooms across the country, something that would have been unthinkable 20 years ago: Doctors and nurses turn away from their patients and focus their attention elsewhere — on their computer screens. By the time the doctor can finally turn back to her patient, she will have spent close to half of the appointment serving not the needs of her patient, but of the electronic medical record. I have observed this myself in my own personal experiences in recent years observing clinicians in situ. I (unfortunately) have also been on the receiving end of the resultant distractions, via a dead parent, at the very hospital where I did my residency training in pre-HIT days. Electronic medical records, or EMRs, were supposed to improve the quality, safety and efficiency of health care, and provide instant access to vital patient information. Instead, EMRs have become the bane of doctors and nurses everywhere. They are the medical equivalent of texting while driving, sucking the soul out of the practice of medicine while failing to improve care. "Texting while driving" is, in fact, an excellent metaphor. The practice of medicine is often a highly-demanding activity, cognitively speaking, just as driving is. Slip up even for a moment, and accidents and catastrophe can occur. To fix them, hospital administrators and clinicians need to work together to demand better products from EMR manufacturers and to urge government to relax several provisions of the HITECH Act, the 2009 law that spawned many of the problems with EMRs. I do not think this is feasible, nor do I think it would solve the problems. More on that below. How did technology that has increased efficiency in every other industry become such a drag on health care? For starters, people who take care of patients did not design or choose these systems. They were foisted upon us. Doctors and nurses know that good diagnosis and treatment requires listening attentively to their patients. They spend years learning to parse the clues that patients offer, both the physiological and personal, in order to provide the right care. The sound of medicine is not the click of a mouse. It is the human voice. Let’s bring it back. To do this well takes time and undivided attention. "Undivided attention to the patient" and "use of health IT" under the current paradigms are incompatible. The terms do not belong in the same sentence. Again, more on that below. ... Instead of making this easier, most EMRs create extra work. A lot of extra work, thanks to endless prompts with multiple choice answers that hardly ever fit the facts and that demand click after click to get anything done. Want to order a simple test? That requires getting through multiple prompts. Need to write a prescription -- an exercise that used to take less than 15 seconds? Another set of clicks. Template madness is the coin of the realm. Four screens of hundreds, from just one EHR, of many EHRs that a clinician might need to use in practice of medicine. Typing, filing, mailing results and placing referrals all used to be done by assistants. Now, EMRs put that burden on clinicians, and we must do it during office visits, or “encounters,” as EMRs call them. And when the wrong button is clicked, the wrong test or drug is ordered, or it does not go through at all, delaying medical care. It’s death by a thousand clicks, and it happens every day. Another excellent metaphor, a derivation of "death by a thousand cuts." However, in this case, it is not just referring to death of the ability to maintain medical practice and retain sanity (and health of the practitioner), but also injury and death of patients. We are frustrated by EMRs because they pull us away from our patients. We are driven mad by the fact that EMRs in different locations do not talk to each other. And we think it’s just wrong that much of the EMR’s busywork is about optimizing billing for the hospital. The lack of interoperability is likely protective against, in effect, mass copy-and-paste on a grand scale through importation of a chart from one EHR to another, resulting in propagation of errors. In any case, interoperability needs to take a back seat to operability (usability). Who is to blame? Start with EMR manufacturers, who lobbied Congress to require every hospital and doctor’s office to install an EMR system; hospital administrators who bought technology that conveniently pushed billing duties onto doctors and nurses; and federal regulators, who imposed on EMRs numerous quality metric requirements that do nothing to improve care. Everyone in healthcare is to blame, including clinicians who DID NOT SPEAK OUT until obvious issues crated the terrible state clinicians find themselves in now. We do not want to go backward. We believe that computing is essential to the future of medicine. We simply want all EMRs to live up to their promise of improving care and making patient information readily available. I've been calling the problems out for close to two decades now. The issue becomes: what to do about it? 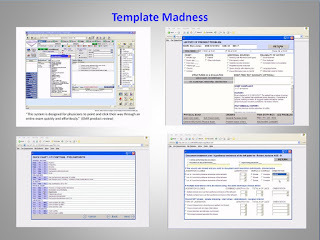 My area of Medical Informatics research in the early 1990s was to move away from the traditional GUI paradigm of menus, widgets, control buttons, etc to explore novel (and menu-free) paradigms of EHR-based data content visualization, navigation and querying. The commercial companies, when shown this, had no interest in even considering such ideas. 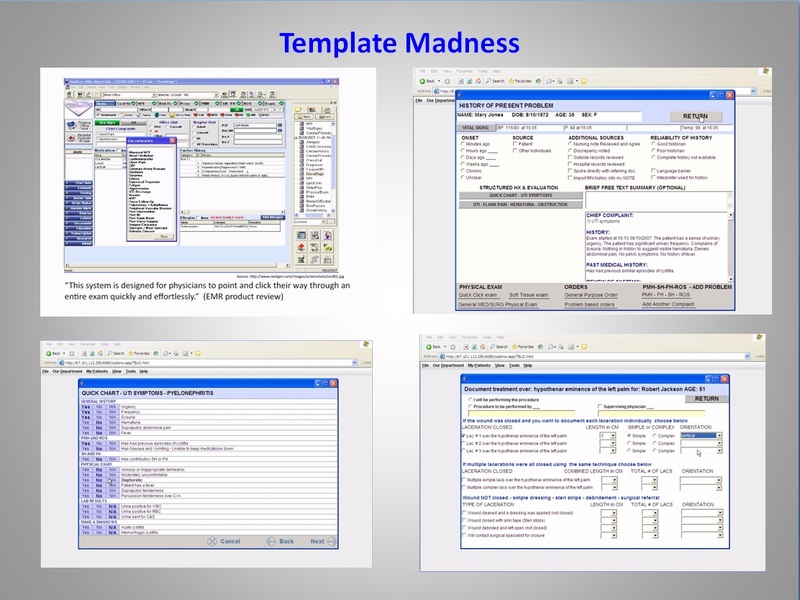 Other avenues to enhance the traditional GUI interface - e.g., AI-based "wizards" of one sort or another that anticipated likely down-the-line choices from currently entered data and presented the choices to the user, better-designed EHR roadmaps and/or AI based on data entry to-the-moment to allow simpler and less time-consuming navigation, etc. - all proved not very helpful due to the complexity of the domain, not to mention its specialties and subspecialties. This experience informed my decision down the line to move to specialized and malleable paper forms for the clinicians, and data entry clerical teams, for high risk and/or high volume procedural or critical care areas such as invasive cardiology, cardiac surgery and the ED. See my Aug. 2016 post "More on uncoupling clinicians from EHR clerical oppression" at http://hcrenewal.blogspot.com/2016/08/more-on-uncoupling-clinicians-from-ehr_91.html for a specific, highly successful example. 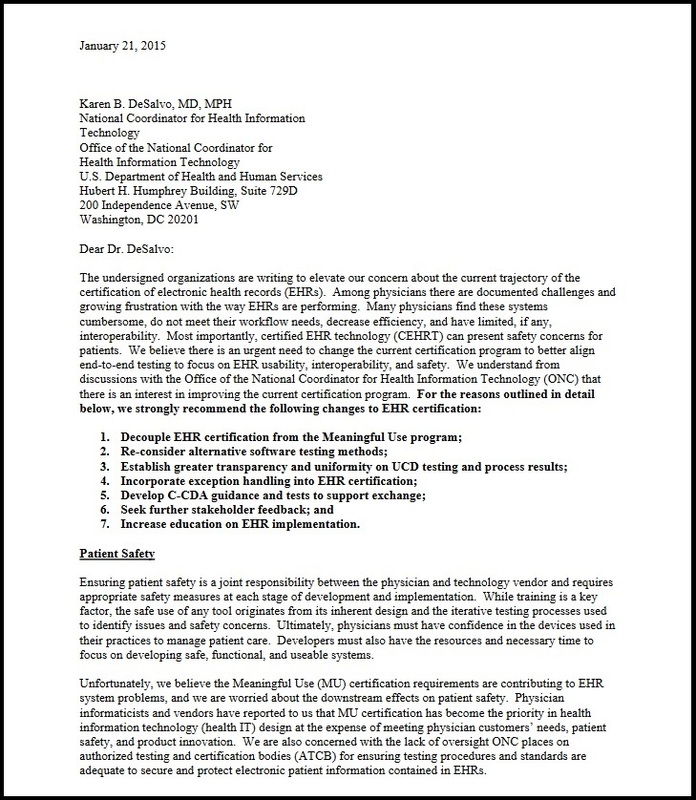 It is my belief that the "traditional" model - GUI-based EHRs with the typical paradigms, and clinicians doing the bulk of the data entry that itself is bloated relative to the actual clinical need, and tying all human-computer interaction to a computer screen roughly at the resolution of one or two legal-sized pieces of paper, can never be improved to the point of not impairing the clinical workday. 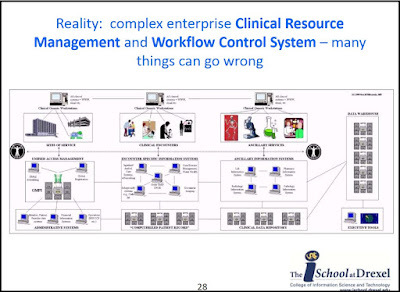 The entire health IT enterprise needs to be rebooted (rethought), especially regarding roles, workflow, and most especially the "data capture load per clinician". When I was writing about EHR issues in the late 1990s and into the 2000s, I was called a Luddite and alarmist (or worse, e.g., see my 2010 posts "The Dangers of Critical Thinking in A Politicized, Irrational Culture" at http://hcrenewal.blogspot.com/2010/09/dangers-of-critical-thinking-in.html and "More on Perversity in the Healthcare IT World: Is Meditech Employing Sockpuppets?" at http://hcrenewal.blogspot.com/2010/01/more-on-perversity-in-hit-world.html). It appears I was correct. My issuing the prediction that the current model of health IT is irreparably broken (or, said differently, that the health IT experiment - and it has been an experiment - under its current paradigms has failed), and needs a top-to-bottom rethinking, will probably be taken the same way. Perhaps doctors and nurses are clairvoyant? Who needs records, anyway? LONDON — An extensive cyberattack hit Britain’s National Health Service on Friday, blocking doctors from gaining access to patient files, causing emergency rooms to divert patients and stoking fears about hackers’ ability to wreak havoc on vital public services. Spanish and Portuguese companies, including Telefónica, Spain’s largest telecom operator, experienced a similar attack on Friday, and there were reports of so-called ransomware attacks in a number of countries, including Italy and Ukraine. It was not immediately clear if the attacks were coordinated or related. The attack on the National Health Service seemed the most serious, since it had life-or-death implications for hospitals and ambulance services. Reuters reported that employees had been warned about the ransomware threat earlier on Friday. Tom Donnelly, a spokesman for N.H.S. Digital, the arm of the health service that handles technology, said in a phone interview that 16 organizations, including “hospitals and other kinds of clinician services,” had been hit by a cyberattack. It is becoming clear that dependence on networked information technology to deliver patient care is a risky dependency indeed; far riskier than utopian health IT hyper-enthusiasts imagined (or cared to imagine). The service’s digital arm said in a statement that the attack involved a variant of ransomware known as Wanna Decryptor. Ransomware is a form of malware that encrypts data and locks out the user. The user is then asked to pay a ransom to unblock the computer. It has become an increasingly prevalent problem. Last year, a Los Angeles hospital paid $17,000 after such an attack; earlier this year, hackers shut down the electronic key system at a hotel in Austria. On social media, several images circulated showing computer screens bearing a message that the user could not enter without first paying a $300 ransom in Bitcoin. Many doctors reported that they could not retrieve their patients’ files. Paper, and non-networked information technology, does not have this en masse vulnerability and drawback. The thieves and cybercriminals who stage these attacks are always "honest thieves." It said that the N.H.S. did not appear to have been the target of the attack. According to the BBC, hospitals in the cities of London and Nottingham, the town of Blackburn, and the counties of Cumbria and Hertfordshire had been affected. If NHS was "not a target of the attack", then who else besides NHS was affected, I wonder? And why were life-critical resources such as hospitals able to be penetrated at all? These attacks have been ongoing for years now. The security of hospitals needs to be a top priority. In the northwestern seaside town of Blackpool, doctors had resorted to pen and paper, with phone and computer systems having shut down, according to the local newspaper, The Blackpool Gazette. Billions of dollars were spent on now-useless computers, but fortunately, pen and paper still works. There is clearly a lesson in that. A bit to the south, in the seaside town of Southport, images on Twitter showed ambulances backed up outside the town’s hospital. In Stevenage, a town in Hertfordshire, north of London, the health service postponed all non-urgent activity and asked people not to come to the accident and emergencies ward at the Lister Hospital. Patient safety is clearly being compromised. Hopefully I will not see the common bureaucratic boilerplate that it was not. ... Spain’s national cryptology center said it was dealing with “a massive ransomware attack” affecting Windows systems used by various organizations, without naming them. If you want information to be secure, do not put it on a computer. If you have to put the information on a computer, do not put the computer on a network. If you have to put the computer on a network, do not expect the information to remain secure. The hyper-enthusiasm phenomenon for mass health IT needs to adapt to the real-world risks, but instead seems mired in utopianism to the point where patient safety is being compromised. Slowing down and/or rethinking care dependencies and security never seem to be an option. LONDON — An extensive cyberattack struck computers across a wide swath of Europe and Asia on Friday, and strained the public health system in Britain, where doctors were blocked from patient files and emergency rooms were forced to divert patients. The attack involved ransomware, a kind of malware that encrypts data and locks out the user. According to security experts, it exploited a vulnerability that was discovered and developed by the National Security Agency. The hacking tool was leaked by a group calling itself the Shadow Brokers, which has been dumping stolen N.S.A. hacking tools online beginning last year. Microsoft rolled out a patch for the vulnerability last March, but hackers took advantage of the fact that vulnerable targets — particularly hospitals — had yet to update their systems. Hospitals, as I've written, are often an IT backwater. The malware was circulated by email; targets were sent an encrypted, compressed file that, once loaded, allowed the ransomware to infiltrate its targets. Reuters reported that employees of Britain’s National Health Service were warned about the ransomware threat earlier on Friday. By then, it was already too late. As the disruptions rippled through hospitals, doctors’ offices and ambulance companies across Britain on Friday, the health service declared the attack as a “major incident,” a warning that local health services could be overwhelmed by patients. Don't Know Much About Health Care, Health Care Research or Quality - Yet Appointed New Director of Agency for Healthcare Research and Quality (AHRQ)!? produce evidence to make health care safer, higher quality, more accessible, equitable, and affordable, and to work within the U.S. Department of Health and Human Services and with other partners to make sure that the evidence is understood and used. Unfortunately, AHRQ has historically had a very small budget for a federal health care research agency with potentially such wide-ranging scope of interest. As discussed, for example, by Gail Wilensky in 2015, in 1995 the agency aroused the ire of some politically powerful back surgeons for questioning the value to patients of some of the procedures they advocated. Of course, if one actively tries to study "safety, quality, and efficiency of delivering health care in different health care settings, as well as on the use of health information technology in achieving these goals," one may produce results that offend certain practitioners, health care provider organizers, or health care corporations. So the agency has been under constant legislative threat of budget reductions or even closure. Despite that, IMHO, the agency has managed to attract scientifically knowledgeable and dedicated staff, and has had a string of renowned directors, most recently Dr Andrew Bindman, and previously Prof Richard Kronick, Dr Carolyn Clancy, and Dr John Eisenberg, three very distinguished academic physicians and one equally distinguished academic health services researcher. Khanna was most recently director since June 2015 of the Illinois Healthcare and Human Services Innovation Incubator, an initiative spearheaded by Gov. Bruce Rauner, a Republican. In that role, Khanna collaborated with other state and federal health agencies to aggregate patient data to better understand the population and efficiency of care. Prior to that, Khanna was the state of Minnesota's first chief information officer. He also held various positions within George W. Bush's administration. specializes in data-driven strategies to improve organizational performance. led a cross-functional team to build a secure data pool with data from Illinois' HHS agencies and other government entities to provide a 360-degree view of each person and family who receives State services to provide efficient program management, strategic policymaking, and customer-centric services delivery. While he may have worked recently with patient data, I cannot find any evidence that his knowledge of that data went beyond how to handle it within IT systems. Note that his official Agency for Healthcare Research and Quality bio says nothing about health care, health care research, or health care quality per se. In a 2009 Interview by IT World, Mr Khanna described a long career in information technology, including positions with the National Council on Compensation Insurance, the American Hardware Insurance Group, and International Technology Consultants. He served in President George W Bush's administration as CIO/ CFO of the Peace Corps, and then of the Office of Administration. His highest academic degree appears to be an MBA. I must admit he seems to be a hard working gentleman who has had recent dedication to public service. That said, I cannot find any evidence that he has any knowledge or training in health care, health care/ health services research, or health care quality. I cannot find any evidence that he has any previous knowledge about any aspect of the health care research and quality that AHRQ is supposed to foster. However nice and dedicated he may be, it borders on insulting to those of us who have labored to promote high quality health care/ health services research to promote safe, effective, accessible, affordable health care for him to be the successor to Doctors Bindman, Clancy, Eisenberg, and Professor Kronick. He appears no more qualified to run the AHRQ than I do to captain an aircraft carrier. Is this some sardonic joke by the ultimate perpetrators of managerialism, the notion that every human organization ought to be run by and ultimately for the the benefit of professional "managers" who know nothing about the goals and values of particular organizations? The AHRQ is only one small, but I would argue important and high-quality piece of the US health care puzzle. This appointment by the Trump regime is only one small appointment in the midst of much bigger and more more controversial, or outrageous appointments, and terminations. However, it is in wheel house, and I do believe I can add this to evidence that at best, Trump health care policy appears to be mired in confusion, and at worst, risks the destruction of US health care. New HHS Secretary, rather than singing unabashed praise for EMRs like his predecessors, states the obvious. However, the "solutions" are the usual boilerplate. In the past, politicians on both sides of the aisle have generally sung unfettered and uncritical praise for electronic medical records and other health IT systems. WASHINGTON – Reducing IT burden for doctors and fostering interoperability are two top tech priorities for Health and Human Services Secretary Tom Price, MD. EHR requirements are causing some physicians to retire too early, Dr. Tom Price said at Health Datapolooza. Dr. Price said that the burden being placed on physicians is causing many to leave practice way too early. He noted that his grandfather retired from practice at age 94 and his father retired in his early 80s. A significant factor is the shift to electronic health records, which has caused doctors to spend much more time looking at screens and feeling more like data entry clerks than health care providers, he said. ... This title for a government-sponsored meeting is bizarre and tasteless in my opinion. What is deemed by ONC to be the major source of this data? Health IT. What Happens When Underperforming Big Ideas in Research Become Entrenched? ... The financial and clinical benefits predicted from shifting to EHRs have also largely failed to materialize because of difficulties in interoperability, poor quality, and accuracy of the collected information; cost overruns associated with installation and operation of EHRs at many institutions; and ongoing privacy and security concerns that further increase operational costs. Regarding Dr. Price's statement that "We simply have to do a better job of reducing the burden of health IT on physicians and all health care providers", I find the statement remarkable coming from the top echelon of government. It's about time, I opine. ... He challenged the health IT professionals at the meeting to make their products more user friendly. “We will work on reducing the burdens at the federal level, but we also need clinicians and IT folks on the ground to help make certain that technology implementation is done in a way that it enhances usability and increases efficiency,” Dr. Price said. 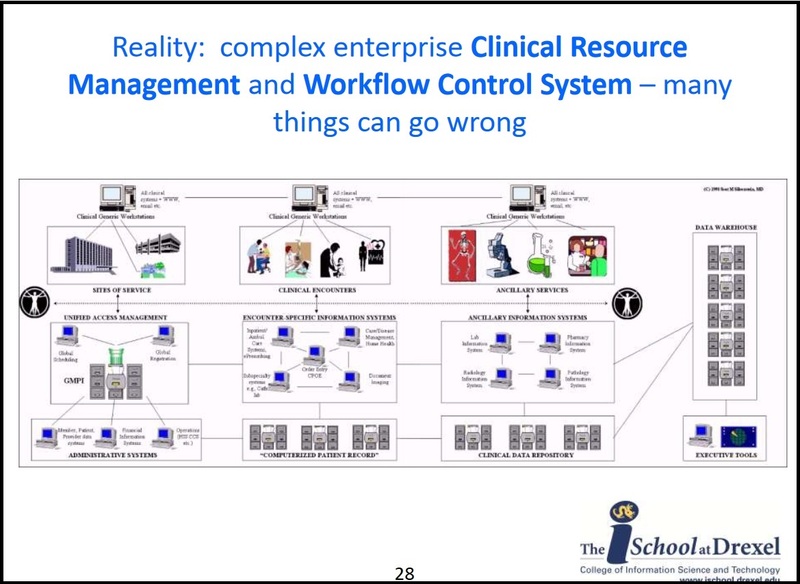 This assumes that complex major information systems such as EHR's can be made significantly more "usable", considering the constraints of time and the cognitive burdens such systems place on already-taxed clinicians. The term "EHR"/"EMR" is a misleading anachronism, no longer reflecting a medical file cabinet replacement but a far larger, complex amalgam of information systems. I do not believe these systems really can be made less burdensome to clinicians to a major degree, no matter how clever the user interaction design. The user manuals to the best of these systems are hundreds of pages long, and many clinicians user more than one system. Further, paper will always be far simpler to use than computers, and no information system in a complex field like medicine will ever duplicate that ease-of-use. The real-world solution to decrease clerical burden on busy and overtaxed clinicians is either to significantly decrease their patient load (unlikely to occur), or to decrease the amount of time they have to spend at computers and the amount of data they are called upon to enter per capita. That solution cannot be accomplished without help from a significant number of - no surprise here - clerical personnel, for data entry, data abstraction and related mundane tasks. ... [Dr. Price] also called for true interoperability, a common goal that has persisted since electronic health records were mandated under the HITECH Act but remains an elusive target. ExampIe: If you have the right tools, how hard could it be to generate nuclear fission at home? 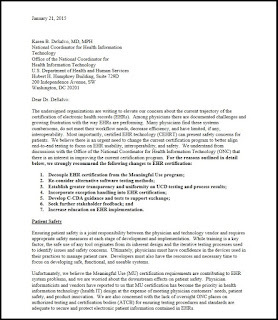 It is my great concern that, should significant inter-EHR system interoperability be achieved, wholesale import of patient data from one system to the next could (and likely would) encourage 'laziness', e.g., uncritical acceptance of the incoming data as correct. The propagation of inaccuracies and errors (already a significant issue with intra-system "cut and paste" as one example), would more readily propagate from one clinician and/or facility to another. The repeat history-taking and fresh rewriting of a new chart regarding new encounters serves a corrective function that could be bypassed through seamless health IT "interoperability." As I've written at this blog numerous times, the issue of basic operability is more important towards practical use of EHRs in the real-world care of individual patients (which I consider the heart and soul of medicine) than interoperability. ... He placed that fault on current federal regulation around interoperability and pledged to create an environment that reduces regulatory roadblocks and allows the technology sector to innovate and foster the free flow of data. This idea is dead in the water if history is any lesson. The lack of any meaningful regulation of the health IT industry over the past several decades, that is, the unprecedented regulatory accommodation afforded the health IT sector, certainly did not promote meaningful innovation in the technology or in interoperability. The primary driver and business equation is "proprietary" == locked-in customers. Dr. Price has taken the first (remarkable) step in calling out the severe impact of the burdens placed on clinicians by current health IT systems and practices. What he and his advisors have not yet done is truly think through the solutions critically. That needs to occur, for the proposed solutions are no "solution" at all. They are merely more of the same muddled thinking and hyper-enthusiastic boilerplate that got clinicians into the cybernetic mess they are in to begin with. While the rare appointments to top health care positions by the Trump administration deservedly get considerable media coverage, lower level appointments sneaking through the revolving door do not. So we hereby present our latest roundup of same, in chronological order by first coverage. Lance Leggitt, who serves as chief of staff to Tom Price, the health and human services secretary, worked last year as a lobbyist for 10 different health care companies, including United States Medical Supply and Advanced Infusion Services. He focused largely on lobbying the agency related to Medicare billing rules, as well as rules for health care supplier accreditations, lobbying disclosure reports show. All these issues are routinely handled by the agency he helps oversee. Note that a lobbyist for many large health care corporations would now be next door to the leader of government policy on health care. Before coming to work at the White House following Trump's inauguration in January, Delrahim was a lobbyist with the law firm Brownstein Hyatt Farber Schreck, LLP. Another client in 2016 was health insurer Anthem Inc, which this year lost a court fight with the Justice Department over whether it would be allowed to merge with rival Cigna. Anthem is appealing the loss. Makan Delrahim served as one of the healthcare conglomerate’s top lobbyists working on antitrust issues as the company pushed the Justice Department to approve its controversial proposal to merge with Cigna. Delrahim would head the office that Anthem is pushing to approve the merger, which physicians and consumer groups say could raise healthcare prices and reduce medical coverage for up to 53 million Americans. According to federal lobbying records, Anthem paid $370,000 in lobbying fees to Delrahim’s firm, Brownstein Farber, between 2015 and 2016. Those fees paid for the lobbying services of Delrahim and William Moschella. Delrahim had previously served in the Justice Department’s antitrust unit under George W. Bush, and Moschella was also a top Justice Department official during Bush’s presidency. The lobbying records said Delrahim and Moschella were working on 'antitrust issues associated with Anthem's proposed acquisition of Cigna.' Lobbying records show Delrahim has also lobbied on antitrust issues for Pfizer, Qualcomm, Ardent Health Services and WMG Acquisitions. Delrahim was last listed as an Anthem lobbyist five months ago. He is currently serving as President Donald Trump’s deputy White House counsel. News of Delrahim’s appointment to the nation’s top antitrust job comes weeks after Anthem lawyers told a Delaware judge that they are relying on the Trump administration to settle the antitrust division’s current lawsuit blocking its Cigna merger. Between those court statements and Delrahim’s appointment, President Trump had a personal telephone call with Anthem’s CEO, Joseph Swedish. Anthem gave $100,000 to Trump’s inaugural committee, and after Trump assumed office, the Securities and Exchange Commission helped Anthem quash a shareholder resolution designed to force it to disclose its lobbying expenditures. Note that Mr Delrahim has worked to promote consolidation of already large health care corporations, yet now would be charged with regulating such consolidation. John Bardis, the founder and former CEO of MedAssets, has been named HHS assistant secretary for administration. Alpharetta, Ga.-based MedAssets was a publicly traded group purchasing and revenue-cycle management company. Bardis founded it in 1999 and grew it into one of the largest healthcare group purchasing organizations. He oversaw the firm's diversification into other areas, like revenue-cycle services, for hospital and health system clients. Bardis stepped down as CEO of MedAssets in early 2015. Note that most recently Mr Bardis was the CEO of a health care financial firm and thus was responsible for that company's financial fortunes. While he has previous experience running other health care related companies, he seems to have no direct experience in health care or public health, per his official biography. The Trump Administration’s pick to lead OSHA will push the President’s deregulation agenda far and deep as he shifts OSHA to a more 'business friendly' focus. According to Administrator-designee A. Prelle Pfuelle, the watchword will be 'compliance assistance' instead of enforcement. Reports indicate the new Administrator, a former lobbyist for the mining industry, will provide 'leadership to curtail funding for enforcement, rescind rules under deregulatory orders, and drop defense of regulations facing legal challenges.' The mining industry has been actively applauding initial moves by President Trump to revoke, rescind, or withdraw several regulations and enforcement actions; Pfuelle may have been instrumental in those early actions. Pfuelle’s past experience includes stints working as a manager in a diamond mining firm in South Africa, labor relations in Liberia’s oil industry, workplace safety officer in the Pakistani ship-breaking association and most recently lobbyist for the Oklahoma natural gas industry. Note that while the OSHA mission is to protect the health and safety of workers, this appointee's past work has involved the financial interests of the mining industry. Health and safety protections may cost this industry money. Furthermore, the article suggests that the appointee may be more "friendly" and sympathetic to corporations that employee workers than to to the workers whose health and safety he ostensibly would be protecting. Note further that he seems to have no experience in public health or health care. President Donald Trump intends to nominate the former executive vice president and CEO of Texas A&M’s Health Science Center to a U.S. Department of Health and Human Services leadership position, according to a White House announcement. Brett Giroir, who currently serves as president and CEO of biopharmaceutical company ViraCyte and as an adjunct professor at the Baylor College of Medicine in Houston, would serve as assistant secretary of health for the department. Note that Dr Giroir is currently responsible for the financial health of a biotechnology company. He is however, unlike many of these other appointments, a physician. When we started Health Care Renewal, the topic of conflicts of interest in health care got little attention in the media or in the medical and health care literature. The topic of health care corruption was virtually taboo. Through the years these topics have become somewhat more prominent. But it took the Trump campaign and then the Trump transition and administration to really put them in the headlines. Dr. Scott Gottlieb, the nominee to lead the Food and Drug Administration, received more than $350,000 in payments in 2014 and 2015 from nearly a dozen different pharmaceutical companies, including Vertex Pharmaceuticals, whose two approved drugs are seen as breakthrough treatments for cystic fibrosis. (They carry list prices of more than $250,000 a year.) Dr. Gottlieb, who has never been registered as a lobbyist but has served as the director of eight pharmaceutical companies and one laboratory company, wrote in a letter that he was prepared to recuse himself as necessary to avoid any conflicts. The literature makes clear that the revolving door process is a source of valuable political connections for private firms. But it generates corruption risks and has strong distortionary effects on the economy, especially when this power is concentrated within a few firms. The ongoing parade of people transiting the revolving door from industry to the Trump administration once again suggests how the revolving door may enable certain of those with private vested interests to have excess influence, way beyond that of ordinary citizens, on how the government works, and that the country is still increasingly being run by a cozy group of insiders with ties to both government and industry. The latest cohort of revolving door transits suggests that regulatory capture is likely to become much worse in the near future. So, as we have said before.... The continuing egregiousness of the revolving door in health care shows how health care leadership can play mutually beneficial games, regardless of the their effects on patients' and the public's health. Once again, true health care reform would cut the ties between government and corporate leaders and their cronies that have lead to government of, for and by corporate executives rather than the people at large.